One of the biggest challenges facing organizations, whether a youth sports club, adult league, or school club is maintaining a consistently up to date website. Members past, present, and future want a way to learn about and reach out to teammates, coaches, and administrators. As clubs start to grow, the old way they were communicating doesn’t work as well because it’s too time intensive, it doesn’t scale, or what used to be achievable is not any longer because there are too many more people. Organizers have more and more to do to maintain the same high level of service. They have a lot of responsibilities and shouldn’t have to become fluent in website building in order to keep everybody on the same page. If online tools are too hard to use, the content becomes stale because there’s not enough time to get the website updated with so many other things going on. Some turn to hire webmasters, which can end up being costly and can lead to delays in getting relevant information posted alongside paying for web hosting. Even if they are fluent in website building, their time is better spent elsewhere. These frustrations led to SquadFusion’s creation. We make it simple to manage your website. We provide tools that are easy to use so you can customize the color, text, and images on public websites without having to learn computer languages. You don’t have to be an expert in web design, find a webmaster, or pay a web hosting fee. We take care of the details so you can focus on communicating with members. We make it easy to edit any field and our staff is always here to listen and carry out any change you need done for your organization. There is no need for leaders to juggle website building alongside a long list of other responsibilities. Devote time to training, organizing, and communicating instead of working on an outdated website. With an integrated platform like SquadFusion, all the data you need to receive and send out can all reside in a single spot. There’s no need to worry about where to go to update different details and your customers don’t need to worry about where to get new information. A clue that it’s time to think about upgrading your page is when you hear multiple complaints that some information is not available on the website or that it’s too hard to find. In order to attract new people, it is essential that your website have a good reflection of your organization. Upgrading your online presence is an opportunistic way to take advantage of potential customers. People want to be a part of a well-run organization, and your website is often times the first impression individuals get. Let them know you run smoothly and have fun. An efficient system with payment processing, news forums, and online registration can make all the difference when choosing between organizations to join. Growing clubs need to have an up to date online platform that can connect teammates, coaches, and administrators. Many struggle to communicate the positive club image they want to because their websites are left unmade or not updated. Juggling website building alongside other responsibilities is a big task for a lot of organizers. 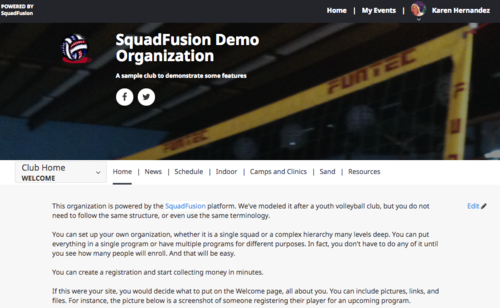 Squadfusion was made to help manage online presence for teams, clubs, and leagues. Let us help you maintain the image you want and connect your members past, present, and future.